Yay new pattern! It's been a while. Yarn: Madelinetosh Tosh DK in Antler, Tilli Tomas Disco Lights in Jade, one skein of each. Needles: US Size 7 (4.5mm) 16" circular, plus a spare needle for a 3-needle bind off. 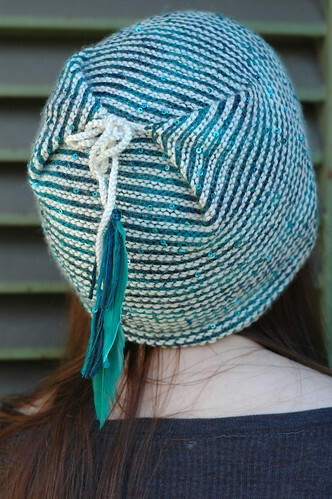 Vahl is an easy little hat using two deeelicous yarns that have been languishing in my stash for awhile. 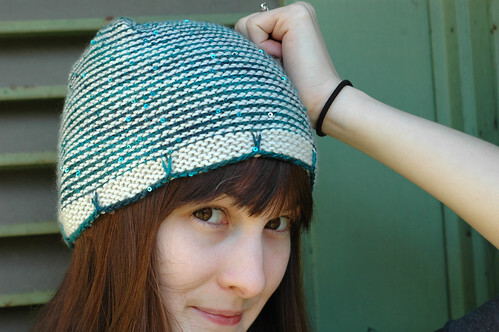 The Tilli Tomas was supposed to be my reward for using up the rest of my stash (ha!) but I dragged it out when I was putting together magazine submissions, and these two became friends and, well, just had to be stuck together. The "Antler" colorway is a very strange white, with a pale, only-slightly-visible green cast. I sort of love it, and it worked well with the Tilli. Any light worsted or DK weight yarn should work, though, and you should only need one ~100g skein of each color. The top has neato little ties which you can crochet, icord, braid, whatever and then embellish with tassles, pom poms, feathers, beads or whatever else you can think of. I'm in a feather phase, personally. In other news, it might be awhile before you see those other two patterns...but I ain't sayin' anything yet. Physical Copies of Go Go Malabrigo Now Available!